Click the cover to get your copy now. She was born to be a speaker!! 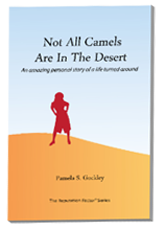 If your group needs a speaker with real world experience then Pamela Gockley is the speaker for your group. Her credentials include over 20 years of experience in business management -training, engaging and building social currency with groups of all sizes. She is a specialist in motivational and business keynote speaking in reputation in Customer Service, Sales, Marketing and leveraging social media. Pam speaks and conducts seminars to groups ranging from school and college classes, to trade associations, to business membership organizations and chambers of commerce. Her subjects include a wide range of business and personal development matters, including her acclaimed book The Reputation Factor: Repositioning to Succeed. To learn more, go here, and be sure to click here to view her upcoming schedule of presentations. Thank you for visiting and please contact us if you need more information.